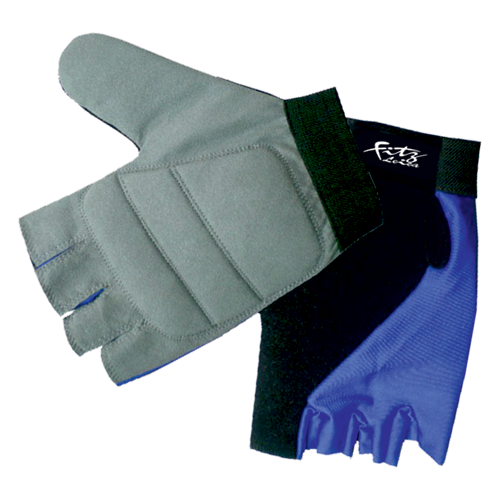 These gloves have been designed using the finest of engineering techniques by people with years of experience to ensure that the stresses and strains involved are absorbed and dispersed to reduce the wear on the main contact points between hand / glove and wheelchair. These gloves have been designed using the finest of engineering techniques by people with years of experience to ensure that the stresses and strains involved are absorbed and dispersed to reduce the wear on the main contact points between hand / glove and wheelchair. We offer two styles of these gloves, using natural soft handle leather and a more durable manmade Amara leather. Both glove styles have a full thumb with half fingers, to provide a good level of protection without compromising on control. The leather palm glove has a fuller, softer palm pad making it ideal for occasional or low level use. The Amara synthetic leather palm glove has gel pads that are positioned to allow the hand to grasp the tyre / rim of the wheelchair, providing a balanced mix of comfort, practicality and durability. Both gloves come with a `brow wipe zone`, for use under heavy use conditions. They are available in 4 sizes: (Please measure across the width of the palm to establish correct size required.) Small - 3" (76mm) Medium - 3 ?" (83mm) Large - 3 ?" (89mm) Extra Large - 3 ?" (95mm).